Put your new coil on the floor with the label facing up. Pull the line through the lower eye of the rod and tie the linen on the reel. Spool the linen on the reel with 10 revolutions of the handle. Look for the line twisting. If the line twist turn the coil with the label facing downwards. Fill the reel with the line until there is approx. 1 mm from coil edge. Wear gloves on the hand that holds back on line. Is required if you spool Fireline. Some expensive spinning reels have Power Roller to reduce the twist of the line with up to 50%. Therefore, these spinning reels with Power Roller work best if the line spool on after this recipe. Insert a suitable screwdriver through the coil center. Attach the screwdriver or better get a fish friend to hold the coil while you spool the line. Exert appropriate pressure on the sides of the coil, so the line does not spooled too loose nor too tightly. Fill the reel with the line until there is approx. 1 mm from coil edge. Wear gloves so as not to burn your hands. 1. Lead the line around spool shaft and tie a simple knot on the main line. 2. Tie a single knot on the tag end and tighten both knots easily. 3. Linen must be wet. Saliva is good. Then tighten the main line up so that both knots meet. Cut tag end of 5 mm above the two knots. 1. Pass the line around spool shaft and drag the tag under the main line. 2. Pass the tag over the main line and back in its own direction. Wrap tag at least twice on the main line. Pass the tag back through the loop formed, where the main line goes through. 3. The line must be wet when using nylon line. Saliva is good. Pull the knot up firmly by pulling the main line and the tag. The knot must lie nicely on the spool. Cut tag of 5 mm above the knot. Thread the eye of the bait you want to use and twist the tag and main line together 3 to 6 times. Complete the twists and thread the tag back through the loop formed by the first twist. To lock the knot, thread the tag through the open loop which has been formed at the top of the knot. The line must be wet when using nylon line. Saliva is good. Pull the knot up firmly and the result should be as in fig. 3. Should a loop form within the knot, simply pull on the tag until it disappears. Cut tag of 5 mm above the knot. Thread the eye twice of the bait you want to use and twist the tag and main line together 3 to 6 times. Complete the twists and thread the tag back through the double loop formed by the first twist. Pull first the tag and then the main line. Cut tag of 5 mm above the knot. Take 2 nylon lines with a maximum 0.05 mm diameter spring and put them together with an overlap of approx. 20 cm. Take left tag and twist it 3 times clockwise on the left main line. Take right tag and twist it 3 times anticlockwise on the right main line. Thread the left tag back through the loop in the middle. Thread the right tag back through the loop in the middle. It must be made from different directions. Now the line must be wet. Saliva is good. Tighten gently up into the two main lines. Beware of the two tags don't fall out. Cut tag of just above the knot. 1. Form a medium big loop on the line. Take the short end of the line and twist it 6 times around the line inside the loop. 2. Find the center of twist and open it so that the top of the loop can be inserted through the circle twist. 3. Tighten careful when pulling in the form "Loop" and in long-and short-line end. Remember again wet the line with saliva. 1. Tie first a loose knot 30 cm up to the main line. Thread the eye of the wobler with the tag and then backward through the eye formed by the knot on the main line. Twist the tag twice on the main line. 2. Thread the tag back through the eye formed by the knot on the main line and on the same side where it originally came through. To lock the knot, thread the tag through the new eye. Now wet the line. Saliva is good. Pull gently the main line and tag so that the knot begins to form. The wobler must not be tied fast to the knot. Cut tag of 5 mm above the knot. 1. Thread the Fireline double through the eye of the bait you want to use. 2. 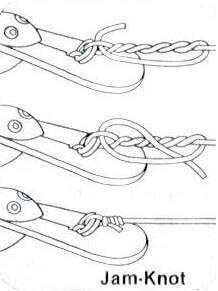 Tie a single knot over the hook. 3. Pull the bait through the loop which is formed. 4. Tighten up by pulling slightly in the main line and tag. Cut tag of 5 mm above the knot. Tips for # 1: It may be difficult to thread the Fireline double through the small eye. Thread first the eye with a single line and then back again. "Arbor Knot" On the fly reel, spool first a backing line with a breaking strength of 20 lbs or 30 lbs. An appropriate length can be between 75 m and 150 m. "Arbor Knot" is used to tie the backing line firmly on the reel shaft, hence the name "Aksel Knude". "Albright Knot" The next step is to tie fly line on backing line. Start by rolling 1 meter fly line of the spool, which fly line came on, remember it must be this end, which is labeled "this end to reel". 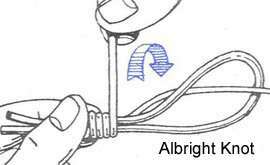 "Albright Knot" is used to tie the fly line on backing line. Fly line is now spooled on the reel, and here will a fish friend be helpful holding the fly line. A pencil inserted through the hole in the spool. Spool the fly line on the reel while exercised a little pressure on the spool sides. 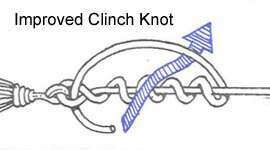 "Nail Knot" We have now come to the tapered leader to be tied on the fly line with a "Nail Knot." The name comes from that we must use a needle with a diameter slightly larger than the fly line. A small tube where the tapered leader can go through, are also suitable. That is what is shown in the picture. "Surgeons Knot" We must now tie a tippet on the tapered leader. There are several reasons to use a tippet. I will mention just one. Switching often flies, you will soon have spent your tapered leader to 30.00 DKK. The thickness of the tippet you need should be 0.05 mm smaller than the thin end of the tapered leader. 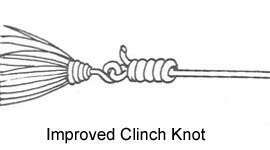 "Improved Clinch Knot" The last knot you will tie on your fly tackle is an "Improved Clinch Knot". This knot attaches probably your fly to the tippet. There is also another knot "Turtle Knot", but I lack a picture. This knot is shown above, but appears again for integrity reasons. 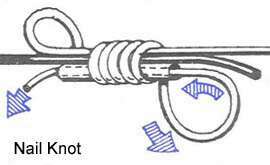 Arbor Knot means shaft knot and tied as shown here in the picture. Spool now backing line, but remember it must be in the right direction. Backing line must go out from the bottom of the fly reel. Read binding text here. 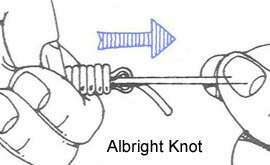 The next four pictures show you how to tie fly line on backing line with Albright Knot. Start by forming a loop in the end of the fly line. Bend the end approx. 5 cm back on fly line. Hold the loop between left thumb and forefinger. Insert from right approx. 25 cm backing line in to the loop. While you still hold with the left hand on the loop, you clamps down the backing line between left thumb and forefinger. Use right hand to twist the tag on loops and backing line. Start at your finger and twist from 10 to 12 laps toward the end of the loop. The windings must be close and quite tight. So far so good. Now comes the hard. Now you need to put the tag of the backing line through the loop on the opposite side as it entered. This means that both backing lines - the main line and the tag - coming out through the loop on the same side. Wet the lines. Pull the main backing line until the looped, which you held in your left hand, disappears. Pull in both backing lines so they tightened up. Pull carefully both ends of fly line with your left hand. Press with your right hand the knot against the fly line loop end, but not above this. Hold fly line (both ends) in the left hand and backing line (both ends) on the right hand. Pull now as tightly as possible, so you form a nice knot. Cut both tags of near the Albright Knot. Now you're ready to spool the fly line on the reel. Remember a fish friend can be helpful. 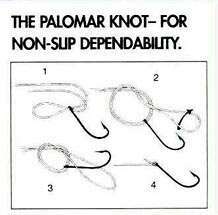 You use a "Nail Knot" to tied your tapered leader on the fly line. 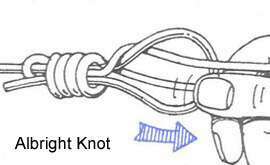 This knot can also be used to tie the fly line on the backing line. 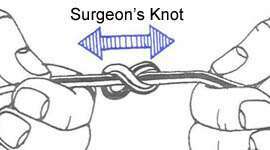 You must use an appropriate needle or a small tube to do this knot. Hold the needle/tube and the end of the fly line between the left thumb and forefinger, so that sticks approx. 5 cm line fly out to right with the needle/tube. With the right hand produced a 30 cm loop on the thick end of the tapered leader. Press the loop down between the left thumb and forefinger beside the fly line and the needle/tube. Use right hand to make 5 turns tightly around fly line and the needle/tube with the tag of tapered leader. Windings must lie close at each other and be at least 2 cm from the end of the fly line. Slip the left thumb and forefinger over the windings so they are not getting loose, while you are with the right hand leading the tag of the tapered leader through the needles eye or hole in the pipe. Pull now the needle or pipe toward the left, then tag comes truly through the windings. FIRST tighten up a bit by pulling at both ends of tapered leader - not the fly line. Look for the windings, trim if necessary. Moisture the knot, and now tight up by pulling simultaneously at both ends of tapered leader so much that the line just "bite" on the fly line. Warning, if you have a lot of muscle power, you can cut the fly line. You tighten now tapered leader and fly line by pulling these two lines as these two "sets" themselves. Finally trim your tapered leader and fly line by cutting the tags of 1 mm from the knot. 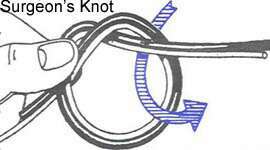 The easiest way to tie the tippet on the tapered leader is with a "Surgeon's Knot". Place the tapered leader and the tippet side by side of each other approx. 15 cm in length, each with its end in the opposite direction. 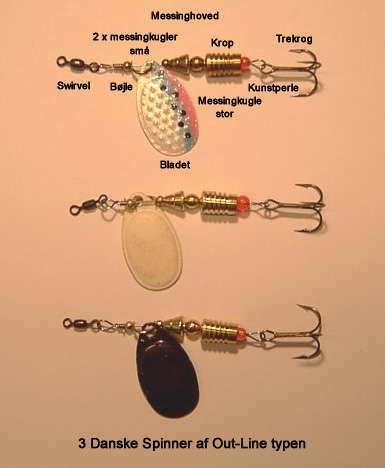 Squeeze on the tapered leader and the tippet with the left thumb and forefinger. Use right hand to make a loop and thread the tag of the tapered leader and the whole tippet through the loop. The knot must be made stronger. Then repeat the following: Thread the tag of the tapered leader and the whole tippet through the loop a second time. Look for the tapered leader and the tippet are not turns around each other. It will weaken the knot. Moisture the knot before you pull it tight. Pull simultaneously in all four lines: the left side tapered leader and tag of tippet, right side tippet and tag of tapered leader. Cut the tags close to the knot. Take the fly between left thumb and forefinger. Thread 15 cm of tippet through hook eye. Make five turns along the line. Take the tag back over the turns and thread it through the opening between the hook eye and the first turn. An open loop has been formed over the turns. Thread the tag through this loop. Tighten now the knot by pulling the tag. Look after the turns are stretched neatly side by side. Trim if necessary. Moisture the knot before tightening up, then the knot lies close to the hook eye. Cut the tag 1 mm from the hook eye. This knot is the simplest to tie a fly on a tippet. Thread the tippet through the eye. Once around the hook sharft. Tie a knot around the line. Tighten up and cut of. Major knot or Turle knot are the same knot named after Major W. G. Turle, England. 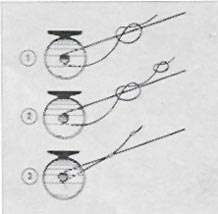 Do you have a ready-made tippet with a loop and will tie a line in, you can benefit from tying an eight-node knot. Thread the tippet through the loop and make a figure 8 as shown. Tighten up and cut of. This knot is ideal for tying a fly on hookline. Fly sits loosely in the loop and therefore gives a lively movement that causes the fish to hook. 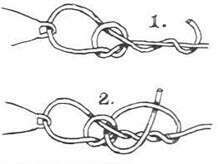 Two ways to tie a "Tip" on its "Braided Leader"
Take your Braided Leader in the left hand and your tippet in the right hand. Let these two overlap each other by approx. 20 cm. Make now a loop with the size of a "falling". Thread the tag af the braided leader and and the long end of tippet twice through the loop. Tightened up with the loop in the mouth. Remember saliva is good. 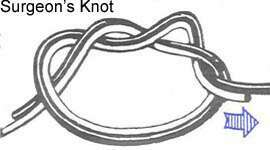 Do you have a loop at the tippet (you buy often a tippet with a loop), you can usefully use the "Loop to Loop" method. This makes it easy to change the tippet size. If you wish to make a "Loop" see the next example. Make a loop as shown. Twist the loop twice around itself down the line and thread the loop from behind in the new formed eye. Tightened up. Remember it with saliva. Cut the tag of 5 mm above the knot. Placer wiren mellem den korte og høje pind på værktøjet med den korte ende af wiren ned ad. Kort pind på værktøjet holdes til venstre. Den korte ende af wiren skal være 14 til 18 mm fra de to pinde, som svarer til længden af kroppen med den nederste perle. Bøj den korte ende 30 grader med uret. Er det rejekrogen, du vil lave, skal kort ende af wiren være 25 mm ned. Se her. Place wire shaft between pins with short end pointed to the left. Bend short end away from you to form 30 degree angle. Leave at least 14 to 18 mm between short end and pin. If you are making the shrimp hook, the short end of the wire is 25 mm down. See here . 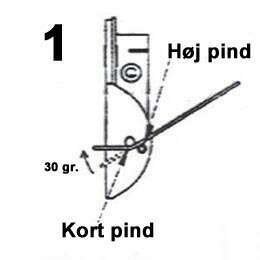 Bøj den lange ende af wiren med uret om den høje pind indtil den rammer den korte pind. Bemærk at wiren springer let tilbage på grund af fjedre virkningen i wiren. Spinner-type In - Line. There is no spin clevis for the spinner blades. Available in 3 sizes. 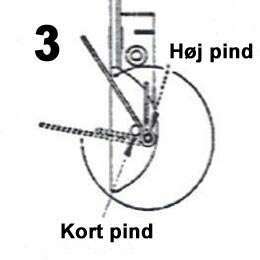 Bend long end around tall pin in clockwise manner until it stops at short pin. Wire will spring back slightly. Hold wiren på plads omkring den høje pind og sving den lange wire ende tilbage - mod uret - indtil den rammer den korte pind. Læg et let pres på den lange wire ende, således at der kommer en let bøjning på wiren, der ligner bøjningen fra før på kort wire ende. Spinner-type Out - Line. There is a spin clevis for the spinner blades. Available in 3 sizes. Leave wire loop around tall pin and swing back to right until long end hits short pin. Apply pressure to place kink in long end. Den færdige "B" Loop, som du har lavet, skal helst se ud som vist her. Man kan montere en lille springring i denne Loop, så kan krogen skiftes meget let. Jeg gør det ikke, for jeg synes, at det påvirker spinnerens gode gang i vandet. Bemærk: I nogle købte spinner sæt er denne loop allerede lavet. Køber du wiren i metermål, klipper du først wiren af i længder på 120 mm. Finished "B" Loop should look like illustration fig. 4. 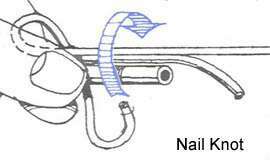 To close this type of loop use a coil spring fastener. Insert a hook to match the size of the spinner in this "Loop". Or a small split ring. Insert over the two wire ends a colored round plastic bead that holds the two ends together. Insert the brass body over the two ends. Your brass body gives throw weight to the spinner. Insert a large brass ball. Brass ball and brass head helps to keep the spinner blade from the body. Insert a small brass ball. Insert spin clevis for the blade with the blade mounted in the spin clevis. Remember to insert the blade correctly. Now you're on track to make an "A" loop. Insert a swivel in "A" loop when this is done. Placer wiren mellem de to pinde, således at kroppen vender op. Afstand mellem kort pind og bøjle for bladet ca. 8 - 10 mm. Bøj den frie ende om den høje pind 270 grader mod uret, så der dannes et øje. Bøj wiren med kroppen mod uret om den korte pind, ca. 30 grader. Place wire shaft between pins with short end pointed up. 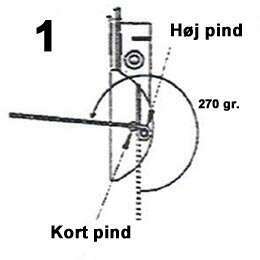 Bend long end around tall pin in counterclockwise direction about 3/4 of a revolution - 270 degrees to form a loop. 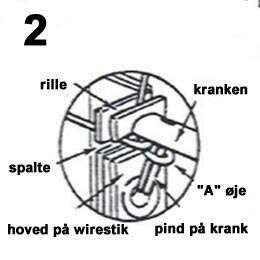 Fjern spinneren fra værktøjet. Tag værktøjet i højre hånd, indsæt wiren i spalten som vist på figur 2 med kroppen til venstre for spalten. Tag værktøjet i venstre hånd, fang øjet med pinden på kranken og drej med uret, således at wirens frie ende glider ind i rillen. Remove wire shaft. 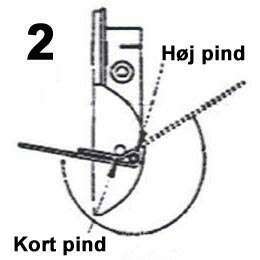 Place loop of shaft over pin on crank with short end up and long end through slot in head. Turn crank clockwise slowly so that short end of shaft slides into groove on head. Drej forsigtigt håndtaget med uret 3 omgange. Der vil være ca. 2 mm spillerum mellem bøjle for bladet og sidste vinding, når der er drejet 3 omgange. Bemærk: Drej ikke over, så bøjlen trykker på wirestik hovedet, for så springer wiren. ADVARSEL: Når du afklipper wiren, SKAL du holde på "tjavsen", for den springer langt væk og kan gøre skade på dine og andres øjne. Husk også jod og plaster. Go to a printable transcript of the instructions. Click Print. With short end engaged in grove, push crank toward head and turn clockwise at the same time. Continue turning crank until short end of wire is completely wrapped around shaft. You will hear a "click" when this occurs. WARNING: When you cut the wire, hold the "tag" because it jumps far away and can do damage to your and others' eyes. Remember also iodine and plaster. Latest news: I have begun to insert a small swivel in "A" loop, so goes the spinner much better in the water by slow in-spinning and the line don't "kink" so much. Try it yourself and see how good it is. Brass, Nickel, Hammered Brass, Hammered Nickel, White, Black and Blue. Green, Pearl, Fluo Yellow, Fluo Orange, Hot Pink, Fluo Red and Fluorescent. The size of the blade 3 is 31 mm and total weight of the spinner as seen above 7 g.
See the fish caught on Fluo Yellow spinner. Even if I insert a swivel in the home-made Spinner is the possibility of line-kink present. By inserting a sheet of celluloid, as shown in the image on the right rectified line kink almost 100%. It is best to make three holes through which the line is drawn. The second option is to bend a piece of plastic or thin metal around a swivel. The third option is to insert a split sinker in the swivel. The fourth option is to bend a piece of tin around the linen. I have only tried the first option and it works as intended. In water with much seaweed and leaf it is not a suitable solution, as it helps to collect more dirt in front of the spinner. Here's a novelty to be tested with a homemade spinner. We are going to Stensån in spring 2010, with many kelt (celt) (please help with the correct word for "udleget fisk" eller "nedgænger") in the river and we'll see if they will get stuck in the silk cord. When it works as good as with the garfish, it is a great way to catch fish. The fish can be gently released and no harm done with the mouth. So the question is simply hanging the blank fish good enough in the silk ribbon? The result will come here on the site when we get home. The spinner with silk cord is tested in Stensån and the result was not as expected. The trout was not fixed in the silk ribbon, I got many bites, but they all fell off before they came ashore. However, I lost no spinner in the river tree roots, but what good is it when I did not get any fish. The picture on the right shows the new spinner in size 4 (12 g) and 5 (14 g) to be tested in Varde Å. Spinner to the left was purchased for DKK 40.00 and is in size 4 (14 g). Spinner in the middle is homemade No. 4 (12 g) price DKK 15.00 Spinner to the right is homemade No. 5 (14 g) to DKK 15.00. However excl. inserted swirvel. Purchased at Ækvator Sport. I was a trip to Gudenåen to try my luck for salmon with shrimp. It is very irritating to fish with shrimp, because they are always falling of the hook. So when I saw a ready-made rig for shrimp - Shrimp Langå £ 4.30 - obviously I had to make one myself. I had my spinner kit with me, so it was an easy thing to wrap one's self. Above is a drawing with dimensions so you can even try yourself. The pictures below show how to do it. Method without responsibility: Use the 0.8 mm or 1.0 mm stainless steel wire. 1.0 mm wire is very difficult to bend and twist with the tool above. Cut the two wires of the following lengths: Hook holder 160 mm and shrimp holder 130 mm. 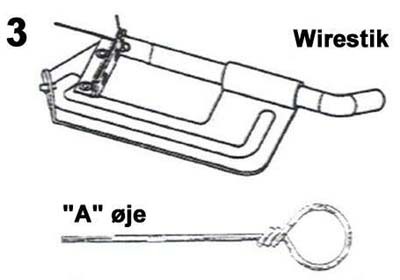 The first eye bent on the hook holder after the text in Figure 1 above. The long end of the wire up and short end 25 mm down. The eye is made after the text in Figure 2 and 3 with the chosen 25 mm down to turn around 3 times before it goes "click" and there is thus no cuttings. An 8 mm pearl (white) with 3 mm hole is inserted over the twist and secured with lightning epoxy. 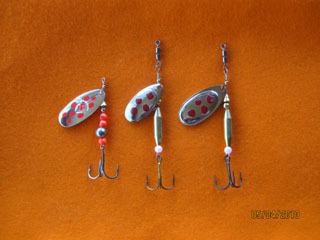 You can also choose to make it as on the original shrimp hook. Here are the "tag" bent tight on the bead approx. 5 mm up. Excess wire is cut off. WARNING: When you cut the wire, hold the "tag" because it jumps far away and can do damage to your and others' eyes. Remember also iodine and plaster. This solution is poor if the pearl bursting with features of a salmon of 20 kg eye will straighten out and goodbye salmon. This wire is called hook holder and saved for later use. Now make the eye in the shrimp holder in the same manner as above. With 25 mm wire down there will be no cuttings when "tag" twisted 3 times on the main wire. Bend the wire 90 degrees so the length is 16 mm. See the picture so the direction is correct. 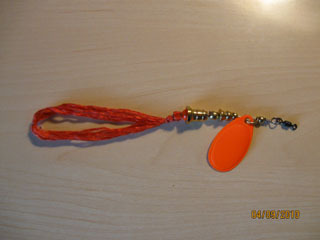 Attach the hook holder with a ø 8 mm bead (orange) with 2 mm hole and insert the shrimp holder as shown in the picture. Adjust the holes in the beads after the wire diameter used. On the hook end is made an eye, as described above with the wire 25 mm down. Then the total length approx. 105 mm, which fits the large shell-prawns. In the eye, put a good salmon hook and "tag" twisted 3 times on the main wire until you hear a "click". Of course you can change the length, so the smaller shrimp also fits shrimp hook. It is recommended to use 1.0 mm wire, to 105 mm and 0.8 mm wire, whose length is much smaller. Shrimp holder now adapted in length to the hook holder. Shrimp holder pushed back toward the hook and the front end cut off so as to reach to the first bead (white). It is very important that the pointed end files round, or else one protrude during use of the shrimp hook. On the Internet you can buy a special wire cutting pliers that does not clamp the wire flat. The wire is now inserted through the shrimp from tail to head and the end plugged into the orange pearl. The beads I bought at Nordicbeads 8 mm round acrylic beads item no. 221122. The wire at Frederiksberg Spring Factory A/S. Loop and twisting of the wire is in the same manner as described above in "How to make your own spinner". The small shrimp hook at 6 cm is adapted for the small shrimps and are made with a wire of 0.8 mm. 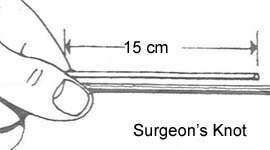 The large shrimp hook of 9 cm is adapted to medium-large shrimp and are made with a wire of 1.0 mm. Bending of the front end is made as to the original shrimp hook, but I've used a spinner's body instead of a bead. 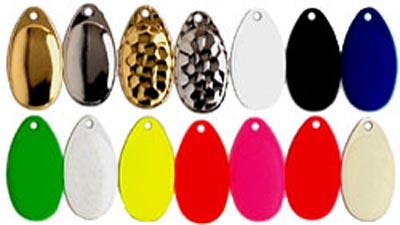 It will keeps the salmon on the hook and it is also a throwing weight so you can avoid extra weights on fishing line. The hole in the spinner body must just be adapted to the two wire of 1.0 mm. The bead is ø 10 mm with 2 mm hole. A note to fish with shrimp: Remember that not all rivers, which is permitted to fish with shrimp in. I know of only two rivers, where I have been to fish Gudenåen and Ätran in Sweden. The big hook with spinner body above is well suited to fish from shrimp bridge (Laxbroen) in Ätran. Here it is not allowed to throw from the bridge - underarm throw used - hence the extra weight is good in the shallow and flowing water.